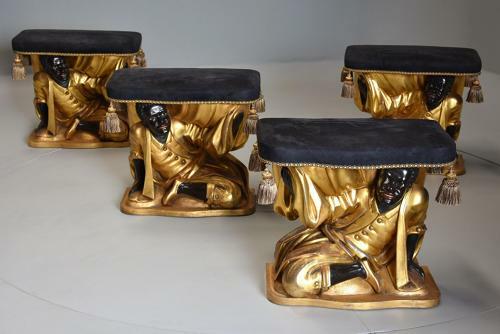 Each of these decorative stools consists of an upholstered serpentine shaped seat with tassel decoration leading down to a carved giltwood and polychrome blackamoor figure, being seated and holding the seat of the stool aloft with carved giltwood drapery. Rushbrooke Hall near to Bury St Edmunds, Suffolk was owned by the famous Rothschild family from 1938-2015 being purchased by Lord Rothschild in 1938. This set of stools are in excellent condition for age, are of stable construction and can go straight into a home or collection.